Adjacent to the Texas Exes Alumni Center, and flanked by the football stadium on one side and a creek on the other side, the Texas Cowboys Pavilion provides 2,400 sq ft of open covered area for pre- and post-game events, lectures, presentations, and exhibits, as well as an area for students to enjoy during school days. The pavilion is a simple, light steel structure that contrasts with the massive concrete structure of the football stadium across the street. The structural system virtually eliminates any sense of enclosure. The pavilion is completely open on one side to the rest of the campus, and on the other side blends with the beautiful creek running through the site. 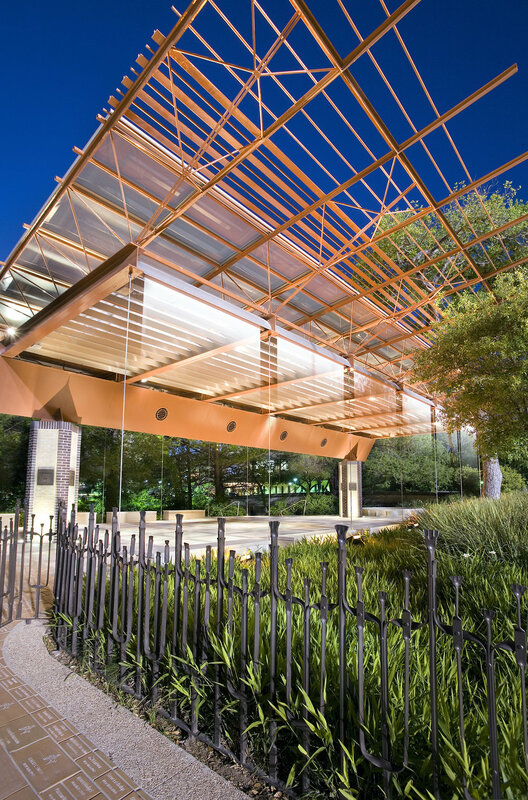 In order to create an attractive, visually welcoming space, the architects designed an expressive canopy structure of 40’x 60’ supported by only two columns. The triangular plate girder spans 50’ in between the two columns, supporting the beams, trusses and glass roof. Post-tensioned stainless steel cables, attached to the tips of the wide flange beams with clevises and turnbuckles, provide the stability required by the system to resist the rotation of the roof caused by unbalanced lateral wind loads. Fin-like louvers fabricated from thin steel plates span between the wide flange beams, carefully spaced and angled to effectively channel sunlight after it is diffused though the ceramic fritted glass roof above. There are many functional elements that have been seamlessly integrated to maintain the clear expression of the structure. Four fans are integrated into the triangular girder to alleviate the heat of the Texas sun. The post-tensioned cables double as tracks for the retractable sunshades that provide a visual screen from the adjacent street. The shades also become translucent walls that may enclose the space for more intimate events, as well as provide a backdrop for audiovisual projections. The speakers, A/V connections and movable spotlights provide flexibility for a variety of events, while the careful placement of the lighting reinforces the clarity and lightness of the structure. Overhead, the roof slopes to a central spine, where a sloping gutter cantilevers to channel rainwater so that it falls freely into a catch basin.